Built as a defensive position for the city of Philadelphia, Fort Mercer is located on the Delaware river in National Park, New Jersey, just south of Camden. 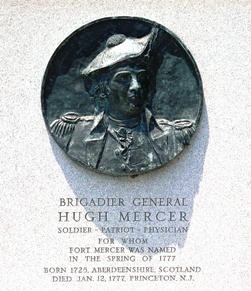 The fort was named for Brigadier Hugh Mercer who was killed at the battle of Princeton. 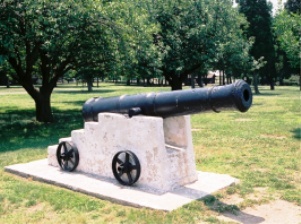 In the fall of 1777 the fort was occupied by the New Jersey Militia. Fort Mercer on the New Jersey side of the river and Fort Mifflin on the Pennsylvania side presented a problem for the British who occupied Philadelphia in the fall of 1777. The Colonials occupying the two forts were often successful at disrupting Britsh re-supply ships from reaching the city with needed replenishments for the British Army. British General William Howe made plans to destroy both forts. General Howe dispatched three battalions of mercenary Hessian Grenadier guards and a foot regiment under the command of Count Carl Emil Kurt von Dunop across the river to take eliminate the fort. 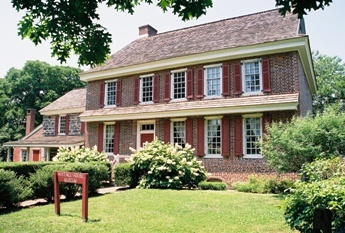 They landed in Camden and stayed overnight in Haddonfield before proceeding to attack the fort. On October 22, 1777 the Hessians, over 1200 strong, attacked the fort. The attack started around 9 pm, and less than an hour later, almost 400 of the attackers were killed. Colonel von Donlop was wounded during the assault, and left on the battlefield by his retreating troops. In all, some 600 Hessians were killed, while the defending Americans lost about 50 troops. The British attacked the fort from the river with a fusliade from the warship Augusta. One of the ship's cannonballs hit the Home of the Whithall's, the owners of the property where the fort was constructed. Colonel van Dunop was taken to the house for medical attention, but he died from his wounds. Angered at the defeat of the Hessians, British General Cornwallis ordered a force of 2000 British troops to attack the garrison. Severely outnumbered, the Americans retreated, burning the fort. 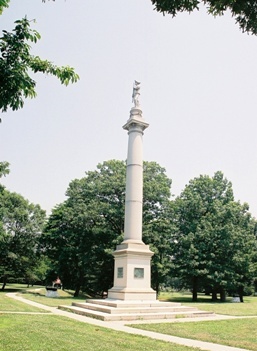 Fort Mercer and the Red Bank Monument are located at the foot of Hessian Ave. in National Park, NJ. The park is open daily until sunset.